Clients are lining up for dinner at the Goldenrod; a unique restaurant with 'Chef's choice' dining located in the friendly Clay and Limestone Garden District. You won't hear any complaints from the well fed patrons at Goldenrod or its sister restaurant Ex-Aster. The food is plentiful and the price is right. Ex-Aster's specialty is the best nectar drinks in town. Diners are seen lining up for breakfast, lunch and dinner. Both Goldenrod and the Ex-Aster appeal to a seasonal crowd of discriminating diners who don't mind the noise from the nearby traffic or the crowds. Patrons have made a bee line to them as soon as they opened for business. They're there to eat and drink, and certainly don't mind being seen in the latest hot spot. What I like about restaurants in the Clay and Limestone Garden District is their broad appeal to many different gastronomic appetites. There's something for just about everyone who stops by to snack or dine. Plus, the management never, ever, ever, ever uses pesticides on any thing. In case diners prefer less trendy spots, there are several cute boutique hotels and restaurant just up the hill a bit. They're not as crowded and the ambiance is delightful. For many patrons, the Goldenrod, Ex-Aster and the smaller boutique eateries is their last big splurge before they settle in for a winter of focus on the future responsibilities. They want to eat the healthiest foods and relax in the best environment with no worries. That's exactly what they get eating locally at Clay and Limestone. In response to the popularity of the C and L garden District restaurants the management is expanding to accommodate even more guests. We thank you all for your continued support and patronage. Just call for reservations. What charming eateries and Clay and Limestome, dear Gail. The diners are lucky and the shots of them eating are superb, but it is the bee line that made my lips smile the widest. Not only are these great places to eat, but the are also wonderful places for those of us who want to gaze on the pollinators, see who we know, see who we want to know. Fun for all. Eat local and organic! Cute post! Bee-utiful, Gail! What I like best about your restaurant district is that it appears to be full of down-home cooking and opens its doors to everyone. No wonder it's so popular with residents and visitors alike! Such wonderful photos and clever post! 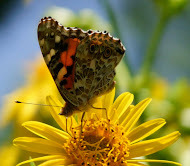 What is the pollinator with the orange, white, and black wings? I totally agree with Kathleen. Best eateries anywhere. Goldenrod is on all the local buffets here as well. I am not sure why, but it has been extremely prolific this year, more so than the last few. Exceptional photos of eateries and their patrons. Such a cute post... delightful! Love your pollinator posts. I think that one photo of the bees in flight would be a winner for a frame to hang on your wall! Super photos Gail. Definitely worth three Michelin stars!!! Fabulous post! It's been a stressful day and you put a smile on my face! Only the best for your patrons Gail! The local organic movement is alive and well at Clay and Limestone! Is that first one a fly?? The green body is so cool! You know, my obedient pant is normally SWARMING with bees, but I haven't noticed them as much this fall. ?? 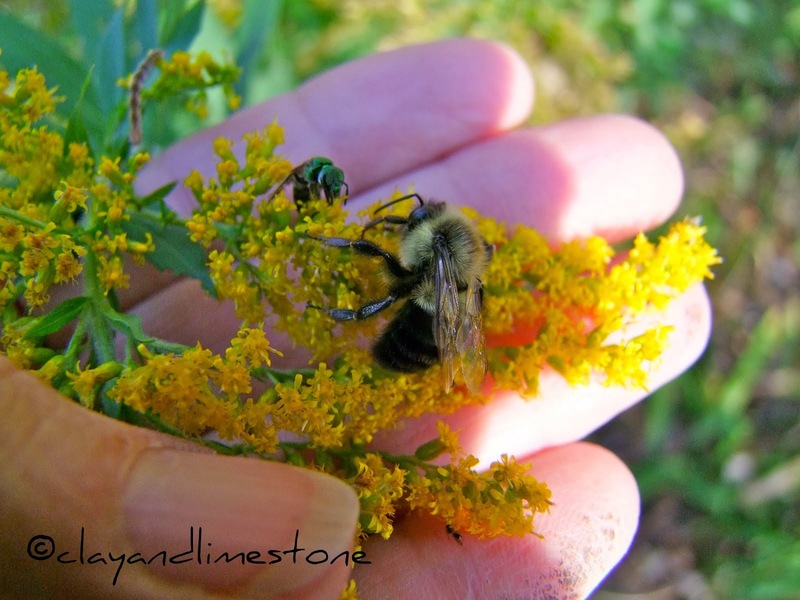 Charming post, Gail ... love the amazing goldenrod pics! What happy patrons you have there Gail! Beautiful photos!!! I especially love number four . . . Bee not afraid!